There has never been a single way to form families, despite the 1950s image of a married mother and father with two biological children who were born after marriage. There have always been single parents, adoptive parents, and parents who do not marry, as well as other family formations. But until recently the law has formally recognized as “parents” only those whose bonds to their children were formed by marriage, biology, or adoption. That has left some children without full legal protections and the emotional security that comes with that—especially (but not exclusively) for those with LGBTQ parents. With recent cases in Massachusetts, Rhode Island, and Vermont, GLAD is ensuring that no children are penalized and all families are recognized no matter how their families were formed. In October 2016, the Massachusetts Supreme Judicial Court issued a decision in GLAD’s case Partanen v. Gallagher, declaring that Karen Partanen, a non-birth mother, can be a full legal “parent” to the two children she raised with her former partner Julie Gallagher. Julie and Karen planned together to start a family. Julie gave birth to both children, who were conceived through assisted reproductive technology (ART) with the consent of both women. They were in Florida for much of their relationship with few protections available, but they raised their children together and presented themselves to teachers, doctors, and family, as parents. They split up after 13 years together, and agreed to co-parent. But soon Julie sought to sever Karen’s relationship with the children because Karen was not related to the children through birth, marriage or adoption. Massachusetts “paternity” law enables children who are born to an unmarried couple to have a determination of who their legal parents are, ensuring that both parents support their children (when able), and that custody and parenting time are based on the children’s best interests. Julie argued that those laws applied only to genetic parents and not to someone like Karen. “This decision is a major victory for families, and especially for children, who should not be deprived of a ‘parent’ because the adults did not marry or used assisted reproduction,” says GLAD Civil Rights Project Director Mary Bonauto, who argued the case. Following this landmark ruling for children, achieved with MA family law attorneys Patience Crozier (who has since joined GLAD’s legal staff), Elizabeth Roberts, Teresa Harkins La Vita, and Joyce Kauffman, GLAD is working to adjust court and vital record forms to include all families. 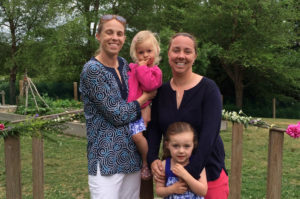 Bryce Helie and Cara Millett, a Rhode Island couple, faced a different challenge in establishing their family’s legal status, and their fight has resulted in a breakthrough in Rhode Island law, establishing a path to parenthood that does not rely on biology, marriage or adoption. Bryce and Cara with their two children. Cara and Bryce had carefully researched the legal and medical issues involved in having children. They decided to use ART, and their first daughter was born to Cara in August 2010. “We were ecstatic, and so happy to be a family,” says Bryce. The couple established Bryce’s parentage through a second-parent adoption in Rhode Island. Cara and Bryce chose to have a second child, this time with Bryce becoming pregnant. In June 2013, Bryce and Cara welcomed their second daughter into their family. GLAD’s Jennifer Levi represented Cara and Bryce along with attorney Katherine Kohm, an associate in the Providence, Rhode Island office of Pierce Atwood. They asked the court to withdraw the adoption requirement of notice to the sperm donor or, in the alternative, to simply issue an order recognizing the two women as full, legal parents, without having to comply with the adoption requirements. On October 26, 2016, the Chief Judge of the Rhode Island Family Court issued a decision acknowledging Cara as a parent, eliminating the need for an adoption, and thereby creating an alternative path to parentage for couples like Cara and Bryce through an “order of parentage.” It’s an important development, creating a route that is less costly than adoption and more closely tracks the reality of families. GLAD is also currently awaiting a decision in Sinnott v. Peck, a case argued by Levi before the Vermont Supreme Court in May 2016. Sarah Sinnott is seeking to establish her legal relationship to the children she and her former partner raised together for over ten years, including for three years after they split up. Sarah and her former partner, Jennifer Peck, had gotten together shortly after Jenny had adopted a daughter. Shortly after that, the couple jointly planned to adopt another child. Because it was an international adoption and they were concerned about not being able to adopt because of changes in international adoption laws, Jenny and Sarah decided that Jenny would be the only one to formally adopt their second child. Throughout their relationship, they both functioned as parents to the two children they were raising. Notwithstanding, several years after they split up, Jenny began limiting the children’s contact with Sarah. When Sarah filed a Petition to Establish Parentage with the Vermont Superior Court’s Family Division in August 2015, the court declined to accept her filing. The court said it was disinclined to hear parentage actions from “third parties” where there has been no adoption, marriage or civil union, ignoring the parent-child relationship established between Sarah and the two children.